Return to Home > Pro-Gezondheid>Olimp - VITA-MIN Plus Senior - 30 caps. 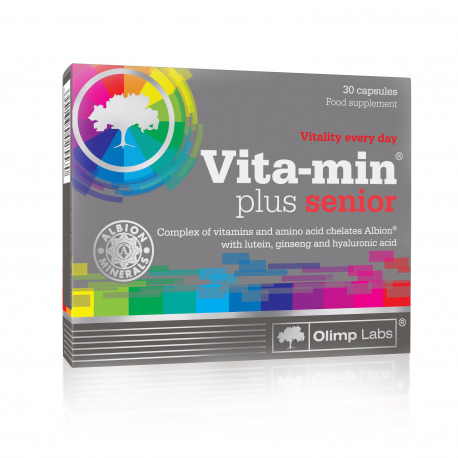 Olimp - VITA-MIN Plus Senior - 30 caps. Vita-min plus® senior is a vitamin and mineral supplement enriched with lutein, hyaluronic acid and Korean ginseng extract. A complex composition of vitamins and highly-absorbable chelated mineral components by Albion® developed especially for the elderly, making it easy to meet the recommended daily intake of necessary micronutrients; enriched with lutein, Korean ginseng extract and hyaluronic acid for maintaining healthy skin appearance. This product is intended for the elderly as a supplement of the daily diet with vitamins and minerals. Recommended use: 1 capsule once a day after a meal drinking plenty of water. Mineral components of Vita-min plus® senior occur, among other things, in the form of highly assimilable amino acid chelates and salts of organic acids which are produced by a leader of the pharmaceutical market of mineral materials – American company ALBION®. In this form bioelements are well-absorbed from the alimentary tract, remain completely safe in dosing, do not irritate the stomach, and possible excess in the form of chelate is removed from the organism; moreover, they do not hinder the absorption of other minerals. It is worth noticing that the proper structure of amino acid chelates Albion® was scientifically confirmed with patented method FT-IR TRAACS® . Note: simultaneous use of other vitamin and mineral preparations and/or medicines should be consulted with a doctor.